WeeWorld | Life as viewed by WeeMann. Fat Fighters, The Debut Gig. 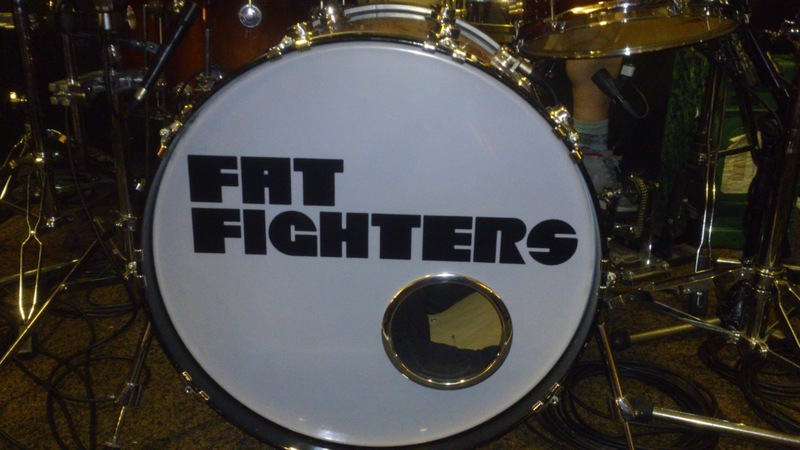 Wednesday evening saw the debut gig from Fat Fighters. 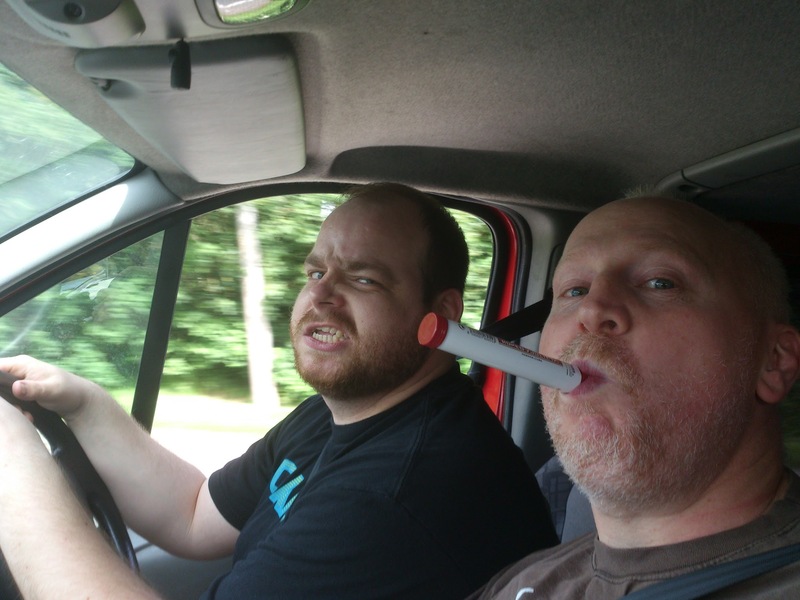 We’ve been in rehearsals since January and built up a catalogue of about 2 hours of material. Soon after we started rehearsing we secured a booking at Bilston’s Robin 2, a great venue that most of us have played previously in various other bands (Jason & I together in Queen On Fire a few years ago). We met up after lunch to load the last few bits of gear into the van before making our way over, discovering our first problem of the day – our secret weapon, the Marshall Snack, wouldn’t fit in the van with the rest of us, so rather than all going together in one vehicle, we had to take a car as well. As it turned out, this turned out to be somewhat of a blessing for Alex and Bren – the rest of us got caught in traffic as soon as we left the M6, after a lorry shed its load. We were about 5 minutes from the venue at this point, aiming to arrive for a 4:30 load in. We finally arrived at 6:00… A phone call to Alex and Bren meant they avoided the traffic and arrived a good hour before the rest of us, so were able to keep the venue updated on our progress. A very rapid load in preceded an equally rapid soundcheck. Fortunately everything went smoothly at this point, thanks in no small part to resident engineer Bill and our engineer for the evening (and future?) Sean Lloyd. We evacuated the stage and allowed the support band, Manchester’s Freedom Of The City to set up, soundcheck and get a short break before the audience arrived and they could play. I quickly re-wired, but still the same problem. It wasn’t the wireless. Finally I plugged straight into the amp, missing out my pedal board, and success. As a result of this problem, the first few songs were a blur as I played while figuring out whether the lack of effects would cause a problem through the gig. It shouldn’t, but still it put me on the backfoot. Four or five songs in we stopped to introduce the Marshall Snack to the audience – the stack next to my bass amp is actually a fridge, stocked with beer, sausage rolls, doughnuts and other goodies. We threw some of the tuck out to the audience before cracking into the next number, while Alex wandered through the crowd with food for everyone. With the audience fed we started relaxing more, the set really starting to flow. We designed the set to include some of the big hits as well as a few of the lesser known fan favourites and every song seemed to go down as well as the last. We finished with Best Of You to a great round of applause, took our bows and left. For the last few years I’ve been focussing my attentions on building my business and have backed off from playing in bands. Alchemy has been a constant in my life, particularly over the last 4 or 5 years, as we have decided to make an effort to get together more frequently and perform the occasional gig (see old blog entries here and here). This year will be tricky in that respect as Harj is working on the Olympics and will struggle to get time away, but we’ll still get together when we can and certainly next year. Otherwise I’ve had short stints with Engines of Creation, Queen On Fire and Usual Suspects, although none have lasted long for various reasons (musical differences! ), but nothing has lasted in the way that I’d like. Hopefully this is about to change. In the later part of last year I received a call from Keith Brough, friend of a family I know well, the Eastments (I’ve played with Steve in a few bands and Andy runs The Smash Room studios in Telford). he asked if I wanted to play bass for his band, previously known as 10%, now re-named Rock Fever. I decided to give it a go for various reasons, not least of which was it would get me playing with new people again and back on the circuit. It’s early days, but it’s sounding great and we all feel the band has real potential. I’ll keep you updated as the band takes shape. 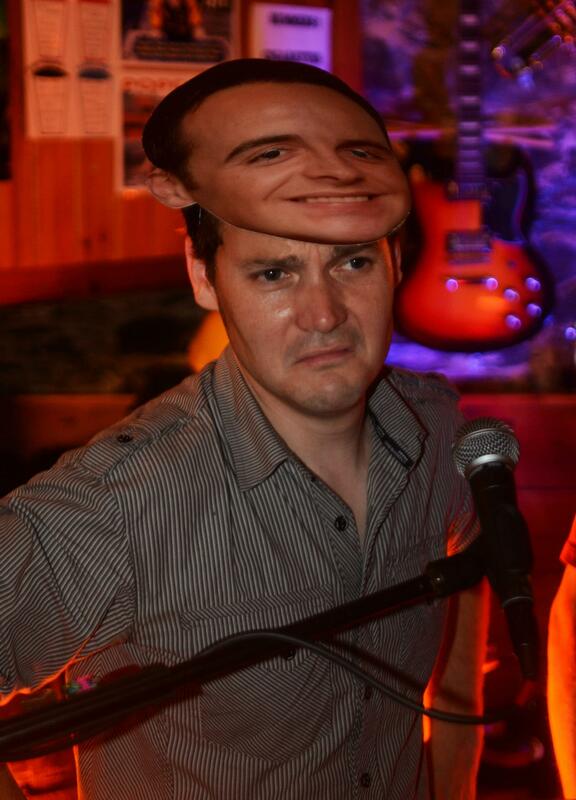 Within a week or so, I took a call from another musician asking if I’d like to form a band. Ed Conway is a guitarist on the Newport circuit and we played together last summer at a garden party. The band had been put together by mutual friend, drummer Paul Crewe, and consisted of five of us performing with little, if any, rehearsal. The gig was a resounding success (despite a powercut halfway through our performance of Happy Birthday for the host’s daughter) and we parted on the agreement that we would have to do something further. Fast forward to January and Lost The Plot is formed. A stripped down version of the band that played last summer, Lost The Plot is a 3-piece consisting of Ed on acoustic guitar, Paul Crew on drums and myself on bass playing stripped down rock and rock’n’roll with a sense of fun (“Madcap Acoustic Mayhem” is the suggested tagline). 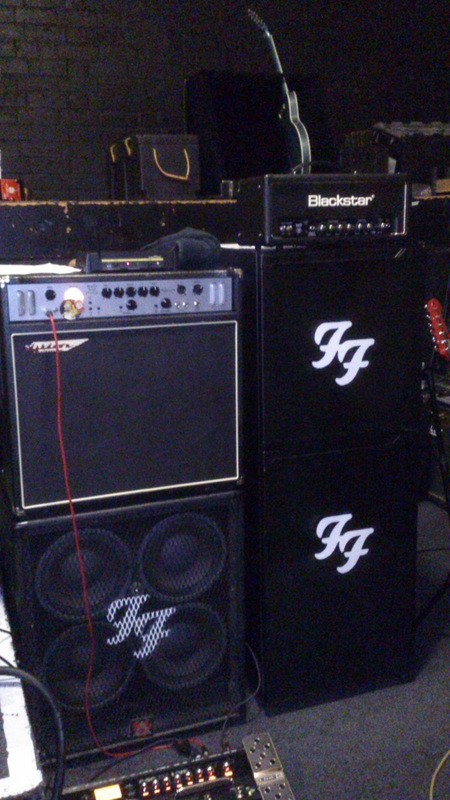 Sunday saw our first rehearsal (immediately after a FF rehearsal) and things sound good straight out of the box. Gigs are already coming in thick and fast and I can’t wait to get this one rolling. 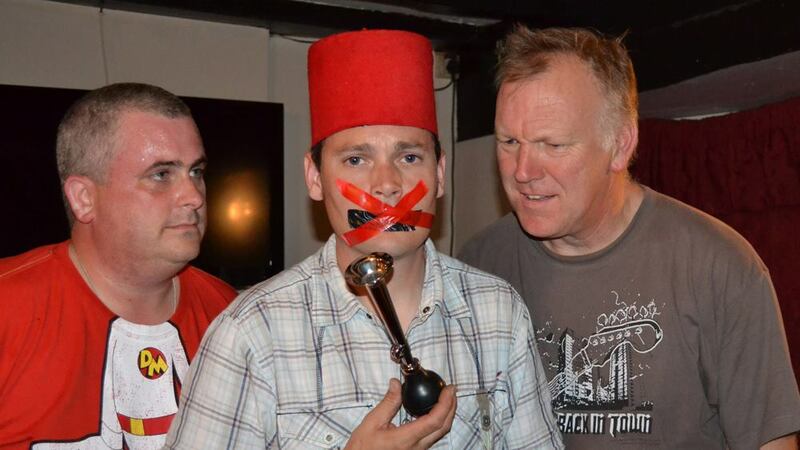 As it stands, our first gig is Sunday 29 April at The Wrekin Inn in Wellington, but keep an eye on my gig calendar for more news of appearances near you. So, from no band to 3 bands in the space of a couple of months. The plan is that the three bands should be able to co-exist with little in the way of clashes. I certainly hope so, as they all offer me different challenges and musical styles. A couple of weeks ago I decided to start to teach myself CSS coding so that I can improve my websites. As you may know, I use WeeMann.co.uk as a base for trying things out before I transfer them onto SiMannDriving.co.uk, so I started by setting up a template for WeeMann.co.uk and a CSS stylesheet. Before long I found myself absorbed, realising that I had spent hours in front of the computer. The result is what you now see. Subtle changes in style, but now I can redesign that style with far greater ease if I decide to. I used the opportunity to add detail to some of the band pages. If you check out WeeMann.co.uk/bands you’ll see a list of bands I’ve played with over the years. I’ve started adding main pages to offer my views and memories of the history of those bands (which I can update later as more occurs to me), so you can read a little about ARDIA, Dirty Shoes, Bad Girl City, vQp and The Hair Bear Bunch. I’ve also added pages for my three current bands – Rock Fever, Fat Fighters and Lost The Plot which will be updated as more info is available. I’ve also taken the opportunity to upload a snapshot of the vQp website. It’s not quite as the site was when we finally closed it, but it will give you a feel for what we were doing. At the moment, a couple of the song files aren’t playing properly, but I’ll try to get those sorted out soon. Further on, I’ve also added a gig calendar as an easy way to see when and where I’ll be playing. I have noticed problems viewing this in Internet Explorer, but it seems fine in other browsers (and was working OK last night in IE, so fingers crossed…). So, I know a little more about web building, but I’m still learning and hope to start working on more ambitious projects in time. Over the past few years I’ve found Facebook to be a great way of getting back in touch with people I’ve lost touch with. A couple of years ago I started finding a few old schoolmates. It soon snowballed as they found other friends, etc, and before long we’d organised a get together. A few of them still kept in touch anyway, so often went out together, and with a lot of them still living around the area we grew up in, nights out became quite common. I’ve been on two of these evenings so far and it’s great to find that I still have a lot in common with the people I grew up with, despite a gap of over 20 years. This weekend I was sitting with my laptop and decided to try searching for a few names from my past when I came up with a hit. Back in the early nineties, my friend Matthew Deal and I went on holiday to New Jersey to stay with the family of a girl he knew from an orchestra swap. He played for the Worthing Youth Orchestra and she for a similar organisation in America and trips were organised annually to play in each other’s countries. Matt and Roberta became firm friends and I met her and her sister, Jane, when they visited the UK in 1990 as we were preparing to perform in a production of West Side Story at the Edinburgh Festival. After gaining Roberta’s e-mail address, I contacted her and have just had a reply back. It’s wonderful that today’s technology can allow us to re-kindle old friendships, once thought long dead, with such ease. I’ve entered a competition run by Queen to remix their hit Don’t Stop me Now. Please have a listen to it by clicking the image below and vote for me! Sorry this has taken a while, but if you were following me on Twitter last week (@WeeMann) you’ll know that I was lucky enough to be invited to the Press Launch for Queen’s Stormtroopers In Stilettos exhibition in London’s East End. The exhibition is designed to celebrate the band’s early years in this, their 40th anniversary year. The cost to get invited? We had to write a review. So here it is, in all it’s glory. It can be seen in full at Queenonline including a lovely pic of me with my friends Tom & Rob. “Will you guys come along to the opening night of the exhibition and write a report on it?” came the invitation. “If we can’t find something better to do,” was our initial response. So, collective train journeys later, QOL members Kes, JLP, WeeMann and Elessar arrived together at the Old Truman Brewery in London’s East End to witness the opening of the Stormtroopers In Stilettos exhibition. Following a scrum to get in we were met by the sight of a gold Red Special, prize in a competition, sat behind a desk. We also get to meet the first of several people at the exhibition who have worked with and around the band, video director Dave Mallet. From here we enter the first room in the tour, a room centred around Smile and the band’s early days. Familiar photos of Brian and Roger sit framed on a wall decorated to resemble Brian’s lounge of the time, a half completed Red Special leaning against the fireplace. In a case are some letters from Freddie for various jobs, along with a comment written to his Mum, “I hope I don’t get these.” It seems he was already decided on where he wanted to go professionally. Of greater interest, however, are the framed drawings and paintings of one Freddie Bulsara mounted on a wall to our right. Moving on we come to a video screen showing the recently rediscovered footage of the band’s TOTP appearance for Seven Seas Of Rhye, featuring DJ Dave Lee Travis sweeping up and using his broom to spar with Brian in a scene reminiscent of the later video for Princes Of The Universe. Mp3 players around the wall play the Golders Green gig, interviews and the 5th session for the BBC in crystal clear quality. Behind a glass wall to our left are Roger’s first drum kit, a Musicman Stingray bass and Guild Red Special, surrounded by miles of discarded 2” audio tape in a mock up of the Rockfield Studios, home to the recording of Bo Rhap. Moving on we get to the room based on the band’s first album. A wall to the right is covered with familiar images – the variations on the album cover and full sized versions of some of the photos used on the rear. It’s here, behind Freddie’s winged catsuit, that we encountered the first of many laptops placed around the exhibition, set up to play tracks from the new 2011 remasters. This first one is playing the De Lane Lea demo of Great King Rat as we put the headphones on. The sound quality is everything you’d expect from this band and sits alongside the original album very well indeed. Queen II is next, with the iconic 4 heads image taking up a full wall. Further interviews play on a video screen over clips from the SSOR video and a laptop announces four versions of SSOR. Sadly we missed this during the evening and the laptops weren’t working during our return trip on the Saturday… More costumes are on show in a case, familiar to anyone who has the Rainbow concert on video. Moving on to the next room we are met with a hospital bed with text describing Brian’s brush with hepatitis. Surrounding the bed are images from the Sheer Heart attack album. As we stand there, we realise the man next to us is Tim Staffell. A quick chat and he suddenly exclaims “Blimey, it’s Dave Dilloway! He’s aged!” We take this as a cue to move on as we let the old friends catch up. As JLP and WeeMann are meeting Tim, Elessar and Kes have moved farther on and met Mrs Mercury herself, Jer Bulsara, and her daughter, Kash Cooke. On the wall behind us is a video screen showing rare and unseen footage. As we arrive it’s the TOTP performance of Now I’m Here, with Brian sporting a Gibson Les Paul. Other screens around the exhibition show footage of Bob Harris interviewing the band and various unreleased gigs – wanna see the inner cover of ANATO come to life? Here’s the place. We move on to the next laptop to listen to an instrumental version of Tie Your Mother Down before moving into the room about A Day At The Races. Freddie’s harlequin catsuit hangs in one corner. We don’t get any further. At this point, Elessar comes bursting back into the room. “Back the way you came, quick!” he shouts, running past us. We work our way back to the doors to the Smile room to see Dave Grohl and Taylor Hawkins of Foo Fighters walk through ahead of a scrum of photographers all scrabbling to get pics of Roger Taylor. He walks right up to us, ushering his young daughter, who points incredulously to an image of her father as a teenager behind his first drum kit. “Yeah, they’re very old photos!” he laughs, before turning to be pounced on by WeeMann, Elessar and JLP who all shake his hand whilst thanking him for his musical contributions over many years. Roger is clearly relaxed and enjoying himself, happy to take time to talk to us, all the while keeping a protective hand on a daughter who obviously struggles to believe her Dad was once young! A little further round, Brian is joined by his wife, Anita Dobson, and they sit for a few moments on the hospital bed to allow people to photograph them. At this point Kes introduces us to Jen, webmaster of Brian’s website. As we’re chatting, in comes Taylor Hawkins. As Jen is having her photo taken with him we ask about his involvement in the Deep Cuts tracklisting. “Why no White Queen or You & I?” we ask. A quick photo op with Dave Grohl as he races through and we then spot Dave Clark, writer of the musical Time (oh, and he may have been in a band in the sixties too!). Greg Brookes also puts in an appearance at this point and we are all introduced. The next to last room of the exhibition is dedicated to the famous free concert in Hyde Park, with a number of video screens showing various clips and the end wall filled with a huge list of the gigs the band played during their formative years. One final room is showing 3D footage of the band – adaptations of the Bohemian Rhapsody and Somebody To Love videos – work in progress based on the current de-rigour technology. Hardly surprising knowing Brian’s love of the medium! From here we are ushered into the bar as the exhibition is closed. A DJ is playing music interspersed with Queen tracks as the bar serves cocktails – vodka and gin based cocktails named A Day At The Races (vodka, apple juice, elderflower and lime), A Night At The Opera (vodka, ginger beer and lime) and A Sheer Heart Attack (gin, apple, blackberry and pomegranate). Security sport Fairy Feller shirts and tall bared chested men walk among the throng. All too soon the evening is over, goodbyes are made and we go our separate ways. A return visit the next morning allows us to fill in the gaps in areas we missed the previous evening, the queue for the opening stretching for 200 yards around the corner. All in all an interesting exhibition with familiar items on show, unreleased audio being played, unseen video being shown. It’s agreed that much of this needs to see release, but whether it will ever become available only time will tell. Grab it while it’s hot – you may never get the chance again! So that’s it. I finally got to meet two of my biggest influences, along with a few others. 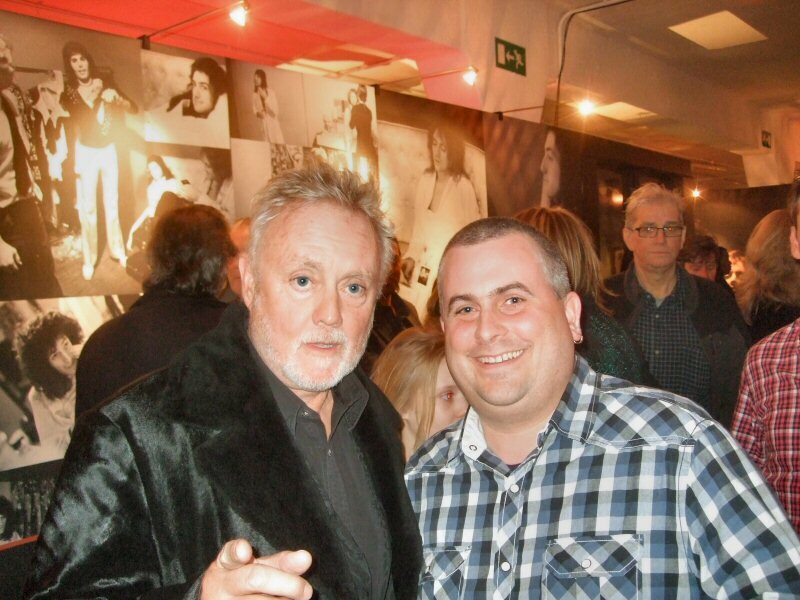 My favourite pic of the night has to be this one of me with drummer Roger Taylor.